"LISTEN...JUST HANG AROUND THE CRAPPY NEIGHBORHOODS AND LET THEM FIND YOU. I'm sorry. what is your name again. "Yeah, youse all legal, and you've fed the kitty, but I'm the ATF tax man and I demand more revenue from youse bums." "I don't care that you made the Kennedy's filthy rich - you're done. Over. And down the drain with you." We don't have enough problems, so we're inviting Weed and Crack to the table next week. No worries, we'll tax them as well. 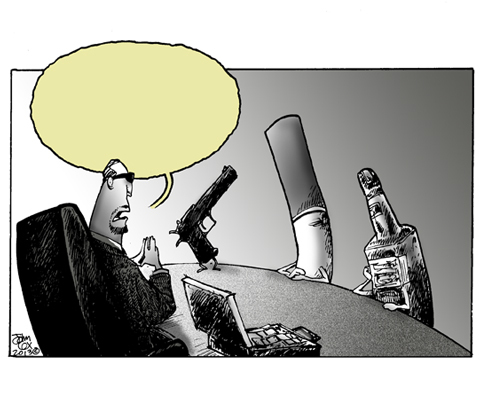 Do you remember the scene in Thank You for Smoking, there representatives for the gun lobby, booze manufacturers, fast food industry and Big Tobacco's chief spokesman, Nick Naylor, are sitting at a club discussing which area is "killing off" the most people? Come on Mr. Gun, Mr. Cig, and Mr.Bottle...Where's Mr. Fork...He's a killer just like all of you. He's suppose to be here! "I've called you all here to inform you that, along with everything else under the sun, you are being transferred under the authority of the former Department of Agitation & Propaganda, which from this point forward will be known as the Bureau of Good Intentions." "Now we just have to wait for Explosives to show up (he's always a late-comer) and this meeting of the BATFE can come to order." "As always, should you or any of your IM force be caught or killed, the Secretary will disavow any knowledge of your actions." "Mr. Jay couldn't be here. He's working very hard with Mr. Empty Suit shaping the cognitive distortions affecting the annihilation of Conservatives, Anarcho-Capitalists, the middle class, domestic energy production, the economy..."
So you see gentleman....excise tax collections are down! That might be a good thing for people's health, but we're talking GOVERNMENT here, and we need our vig. So it looks like we'll have to raise the excise taxes...again. And the governor doesn't want to hear anything about 'bootlegging'. A friend of mine suggested the following balloon quote: "Where's the pressure cooker?" Thought about it. I like the "high capacity assault pot" somebody said earlier. It has to be the one with the pistol grip, though. Loop handles are OK (for now). We all know which one of you kills more people. This page contains a single entry from the blog posted on April 28, 2013 2:46 PM. The previous post in this blog was Website Banner Commission.